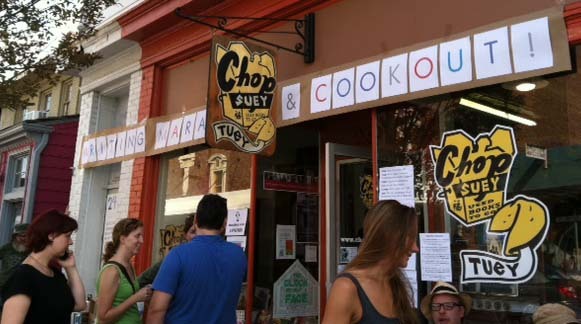 Local writers gathered for workshops on the second floor of Chop Suey Books this weekend, and in between sessions sipped Tall Bike Coffee on the sidewalk and ordered burgers and hot dogs from store owner/grill master Ward Tefft–all as part of a 26.2 All-Write, All-Night Writing Marathon and Cook-Out to benefit the Richmond Young Writers. At Saturday’s opening session, “Write Now,” workshop leader Valley Haggard, Executive Director of Richmond Young Writers, led us through a couple of timed writing exercises from Natalie Goldberg‘s Writing Down the Bones, a book that I read years ago and now realize that I need to revisit. 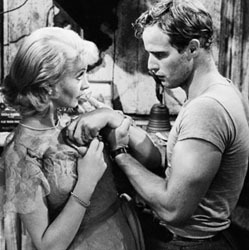 Vivien Leigh and Marlon Brando as Blanche DuBois and Stanley Kowalski in the 1951 film adaptation of the 1947 play / britannica.com. Early in the afternoon, I left Chop Suey to focus on another writer’s work across the street: To mark the beginning of Richmond’s Tennessee Williams’ Centennial Celebration, the Byrd Theatre hosted a free screening of A Streetcar Named Desire, introduced by Carol Piersol, Artistic Director of the Firehouse Theatre (and my acting teacher), and John Knapp, Artistic Director of Richmond Triangle Players. After Streetcar, I returned to Chop Suey and to my own writing, catching the end of a Writing Sampler workshop followed by a free-writing session. I noticed something that I hadn’t seen earlier in the day. On the curtain that serves as the door to the closet in the back corner of the writing room, someone had pinned a sign that read “Enter the Fort of Solitude.” Throughout the free-writing session, one of the Richmond Young Writers wrote there, behind the curtain. At the end of the free-writing session, I retreated to my own Fort of Solitude on Grace Street but returned to Carytown before daylight. On the sidewalk across from Chop Suey, author Eliezer Sobel led a small circle of writers through a sunrise meditation and writing session. When we closed our eyes to begin, it was still dark. When we opened our eyes, it was light, and we wrote about 9/11 and other numbers on our brains.